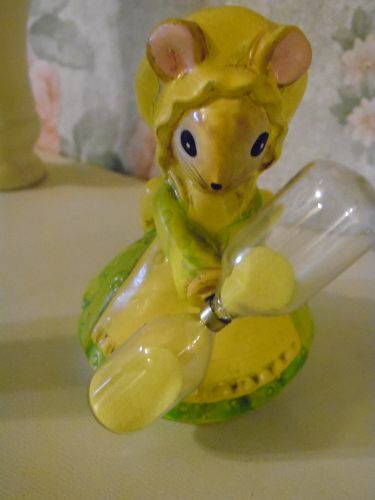 Wonderful vintage House mouse collectible hourglass egg timer by Lorrie Design, a darling kitchen mouse that was made in Japan. Hand painted paper mache finely dressed mouse has a little timer that you can spin. Joseph Originals Lorrie Designs tag is missing. But the foil Japan tag is there No chips, cracks or missing paint.She's a cutie.Measures about 3 1/4" tall In very good vintage condition. A really nice quality cookie cutter made of metal for precise cutting and a nice wide plastic edge in green plastic. I wish I know who made these, as they are vey nice. This Christmas tree measures 4 3/4" tall. Nice 1 1/2" depth too. You could use them to cut out little tea cakes. 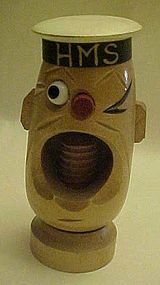 I will be listing a snowman cutter too. 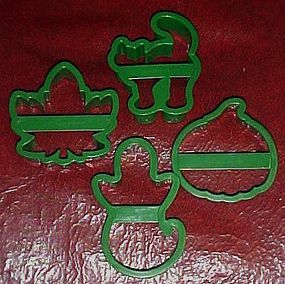 Princess House Assortment of four fall & Halloween cookie cutters. Quality made to last. Pumpkin, Halloween cat, Ghost and leaf. All are gently used and in excellent condition. 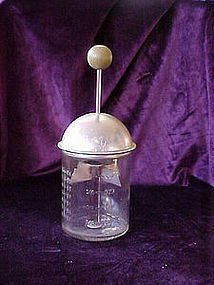 Wonderful 4 7/8" Tall Cookie Stamp or Press by Ellie's Kitchen. One of a Series of Santa's Around the World, this one is the USA Santa. A Wonderful Addition to any COOKIE STAMP OR PRESS COLLECTION and of special interest to collectors of HOLIDAY OR SANTA COOKIE STAMPS. 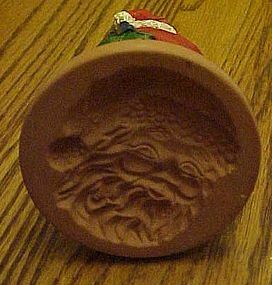 Great condition without chips or cracks, I do not know if it has been used and IT may need a little cleaning.Terra cotta stamp area, resin Santa. Get ready to make spooky cookies. 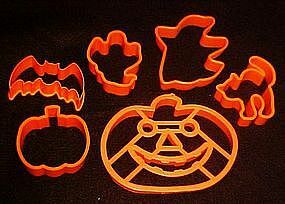 We have an asssortment of plastic cookie cutters of various halloween shapes. halloween cat, bat, two different ghosts (or maybe one is a witch),a pumpkin and a great big Jack-o-lantern that measures 4 1/2" by 6". All are in great condition. Sold together as one unit.